Bright green military caps are one of the most sought after men’s fashion items in the urban jungle of the 21st century. A classic staple of modern fashion, the military caps can be found in many urban environments, music festivals under the blistering sun, cultural gatherings, and many other urban places with many different subcultures which can be seen rocking this trendy cap. It never fails to grab the attention of anybody, since the stern military feel definitely makes it stand out of the vast sea of regular trucker’s caps and baseball caps. Our Ezycaps Ripstop Military Cap is a great example of a high-quality ripstop urban cap. Not only that the military cap looks great on anybody, as its military texture and material easily stands out with style, we are also offering the option of having your logo or message embroidered and printed on the cap. It is perfect for embroidery and other transfer print ideas. It’s a great idea to promote any logo, message, or picture you may choose to print. 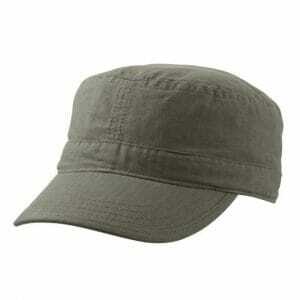 Designed for comfort and style, the Ezycaps Ripstop Military Cap has a loose enough material not to cause sweating. It is manufactured with a perfectly structured design which offers nothing but comfort and stability. This is the perfect promotional item for your business idea or other promotional marketing uses, if your staff appreciates a more modern and casual look. It features high-quality ripstop fabric, an offers a range of classic colors including Black, Charcoal, Khaki, and White. It is perfect for any “tactical duty”, as well as any outdoor activity you may find yourself into. The ripstop fabric of the hat makes it very durable and tear-resistant, while the Velcro fastener ensures stability and cozy comfort. Ripstop fabrics, as the material endures a lot of pressure and damage, are actually very carefully interwoven fabrics which are often made of nylon. They are manufactured using a special technique that reinforces the material and makes it extremely durable. It’s practically indestructible to regular tearing and ripping, as it will take an extreme amount of force to rip and tear this crosshatched high-quality military cap. The many advantages of the fantastic ripstop material are, firstly, the great strength-to-weight ratio which gives absolute durability and light weight at the same time. At the same time, the pattern of the crosshatched weave leaves no space for tears and rips, and, amusingly enough, the same material is used for yacht sails and hot air balloons, as well as kites, parachutes, sleeping bags, and durable hammocks. The many uses of this weave and material is proof enough that the hat’s durability is unmatched and it should definitely be on your list of essential camping and outdoors items which you do not want to find yourself without. It is absolutely necessary for any camping trips and picnics, as it provides a hefty protection against blistering suns and terrible storms. So, if you are searching for a very effective headwear to print your company’s logo, or your team’s logo, or any other business idea, the Ezycaps Ripstop Military Cap is the way to go, and it guarantees nothing but durability and the logo will never fade away after many washes. Whether you are getting in touch with nature in the great outdoors, or you are wandering the streets of the city, the Military Ripstop Cap delivers.